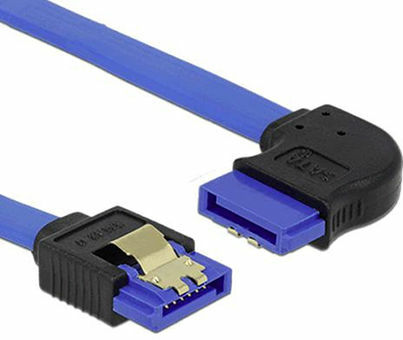 This SATA cable by Delock enables the internal connection of various SATA devices, e.g. HDDs, controller cards or Flash memories. It complies with the latest standard and provides a data transfer rate of up to 6 Gb/s. It is downwards compatible to the previous SATA versions, but can then only reach the respective transfer speed. When connecting this cable to a HDD the cable will be lead to the right. The metal clips on the connectors ensure that the cable reliably clicks into place.